All of the buses stop here. All Dublin roads lead here. Every guide book tells you it is a must see. It seems even the river Liffey flanks it attempting to keep you from leaving easily if you try. Every young person makes plans to meet here late at night. The history of the place is palpable. I don’t really like Temple Bar. It pains me to say it because I love everything about Dublin and Ireland in general. 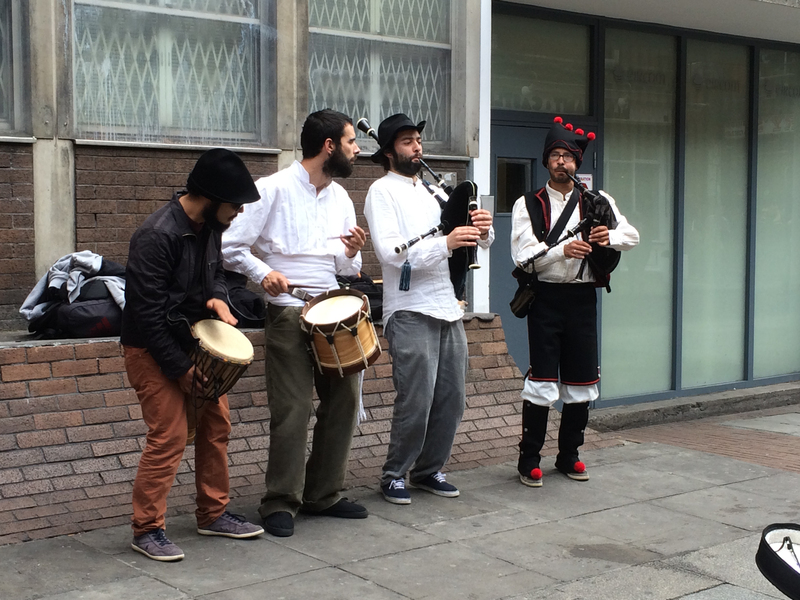 I love the energy and the color and the music of the Temple Bar district. (There is live music here every night in most of the pubs.) But, I can’t stand the crowds and I don’t like the mood of the people after dark. If your wallet is going to get lifted it will be here. If you are looking to get in to a fight with some drunk American college students this is your place. I much prefer the dark pubs with local people to talk and laugh with, great hot food, traditional live music where you can actually hear it, and bars where I can actually order a pint without getting elbowed by a co-ed on their 18th birthday drinking for the first time. I’m sorry Dublin. I am glad it is a tourist draw and I want people to keep coming and I want them to spend all their money in your city. Maybe I am just getting old… Slante. THE Temple Bar both a bar and a district. The place to come and have fun and drink and get crazy. Or the place to avoid if you want the real Ireland. I feel exactly the same. I was there in 1999 and it seemed a little more exciting and a little less drunk college person. But then again I was a lot younger then so it was probably more interesting to me. 🙂 Thanks for visiting. And thanks for the comment. Probably about the same as me then. I’m not adverse to a drop of something…especially while on vacation and meandering around, but beyond the pubs, there seemed like at that time there were more funky shops and things to see, but now Temple Bar only seems to be equated with the nasty drunks. I have been enjoying your Irish blogs, but felt compelled to comment on this one as I feel the same way. Cheers! Thanks! I’m glad you are checking in. I just read a few of your posts. As a photographer I love your theme of placing music with photos. I too have lots of songs, bands, or albums that take me back to a place or time. I look forward to what’s to come. That’s right! There are far more interesting pubs with more interesting people to talk to. Thanks for the comment. I haven’t been there but I know exactly what you mean and don’t feel it’s blasphemous to say it. Ha. Thanks for making me feel better. I rarely point out the negatives of a place but felt I needed to on this one. Have not been to Ireland Jenny, but I totally relate where you are coming from. Your word pictures such as “mood of the people” speak volumes. So important to listen to your gut instincts (and you will also still have your wallet) in the end. Very glad to have you. Thanks for the comment. I really appreciate it. It makes me keep want to write and post my images. I agree. I am glad I went there but wouldn’t rush back! Perfect sentiments. One should at least walk through and see it but keep on walking through to a different pub. 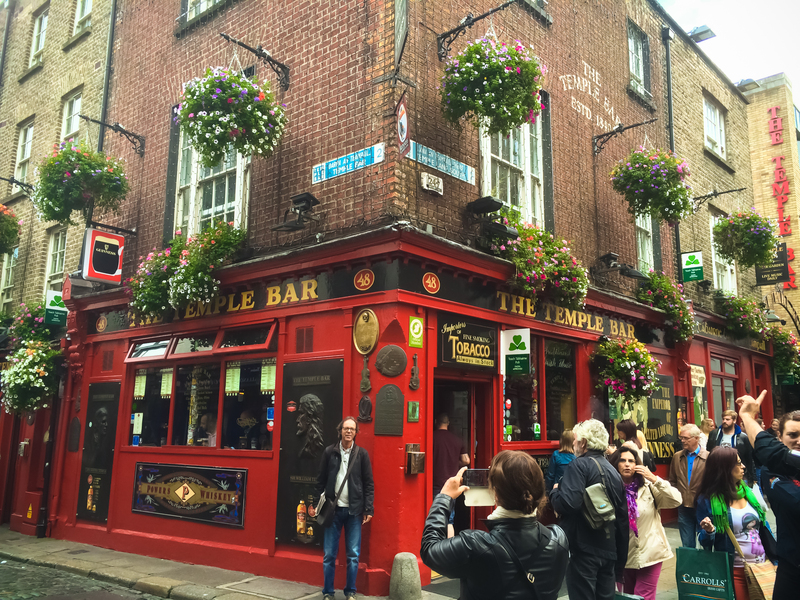 Completely agree – I don’t think I would want to be anywhere near Temple Bar after dark!! Nice post. Been a long long while since I went to “Doblin”. Love the musicians you show. Cousins to my Breton ancestors. Do you have a blog? When I click on your name nothing comes up. The light is always on. That’s a great sentiment. Thank you. That’s how it should be in an ideal world right? The door is always open, and the light on. Make yourself(ves) at home. And at least it works in a blog. No thugs, no hurry. You sound like a southerner now. Ah been ter graduate school o’er there yonder in Tuscalooser, Alabamer. Roll Tide! Yes Ma’am. Praise the Lord. First two weeks I couldn’t understand a word in class. And I’m bilingual English-French. But the ac-cint? Then Ah learned me Sudern. Lots of fun. so… Ye be good naw ye hear? Yes. But the real question is do you like Sweet Tea? How did you like the food? I’m afraid I do like the mint julep though. Very nicely written, I like your style. Those first lines draw you right in. Photos are pretty cool also. I’ve never been to Dublin, keep meaning to go, never quite get there. Amsterdam…now, there’s a different story. You must go some day so we can compare notes! OK…on my list of things to do. Now all I have to do is quit my job…and go. Yah, no kidding. You and me both. I completely get what you mean! That’s how I felt with a good amount of places when I studied abroad in Brussels. Sometimes tourists just get in the way of the real essence of a place. For sure! I suppose it’s true too of wherever home is. Some of the places tourists go or people go for a night on the town are not even remotely my favorites. Thanks for the comment. Good to hear from you again. Thank you so much! That will keep me going! For anyone looking for a great pub in northern Dublin, try “The Hole in the Wall”, Blackhorse avenue. Open fires, good food… Nice atmosphere! Specially on a Sunday afternoon. Great to know! Thank you for stopping by and for the comment. Great point to visit earlier. It is certainly more easy to walk through. I was there a little earlier this time and it had t gotten too crazy yet. Thanks for the follow and for the comments. I look forward to chatting with you in the future. Good point and great to know! Where do you live now? Awesome. I love Dublin too! I wish I had the guts to stay and live there a while.